This is certainly a challenging question. The exact details regarding every known human pathogen may never be known. However, some concepts are worth exploring. The issue should always be considered in the light of the large body of biblical and scientific evidence that there was such a Flood, and so we need to look at possible mechanisms to explain how these diseases did survive the Flood. The following suggestions should suffice to show that even if we exclude any miraculous intervention, there are potential answers which between them are probably adequate to cover the organisms concerned. In addition, there may be aspects which have not even been thought of yet. By this means, some disease-causing organisms may have been much less particular about their chosen host, and could thus have come through the Flood in some of the tens of thousands of animal species carried on board the Ark (just as today, tuberculosis carried in cattle can infect human beings), only later ‘devolving’ (specializing) into their present ‘human-only’ status. (See also the Appendix.) Alternatively, some which now only survive inside a human body may have been robust enough to survive outside of any host. There are many disease-causing organisms today (for example, those causing tetanus and anthrax) which can form very hardy, durable spores, enabling them to survive a range of conditions outside the body. Many parasites of man such as tapeworms have intermediate host stages in various animals such as pigs and cattle, which could have carried the disease through the Flood. Those which do not now may have simply become too specialized, and may formerly have been capable of infecting an intermediate host. Also, the apparent dependence of some tapeworms on humans for the adult, egg-producing stage could be another case of specialization, as similar tapeworm species can use other hosts to complete their life-cycle. This is likely to be relevant for viruses in particular. Random changes (for example, mutations) have never been shown to generate significant amounts of new teleonomic (functional, project-oriented) information. Thus they do not create a new organism, or cause any true (uphill) ‘evolution’. However, it only takes an informationally insignificant accidental change in the protein coat of a virus to vary the way it is recognized by an immune system and cause a major shift in infectivity.3 Thus, a harmless green monkey virus may begin causing serious illness in humans. A virus is nothing much more than a protein coat and a single packet of information (RNA or DNA). It has no complex cellular machinery, and should not really be called ‘alive’. It hijacks the machinery of an existing cell. In computer language, it is really analogous to a piece of ‘software’ which modifies the software of a living cell so that the ‘hardware’ of that cell can make copies of the virus ‘software’. It is a program for making copies of itself using machinery it does not possess. Since in evolutionary theory, fully fledged cells had to exist before viruses, the latter are not some evolutionary intermediate between life and non-life. Mutational shifts in viruses are not on the way up to a ‘higher’ form of life—a virus has never been observed to give rise to anything other than a virus. No informed evolutionist should use mutational change in viruses as a defence of molecules-to-man evolution. A number of viruses are known to set up symptomless carrier states. For example, the chicken pox/shingles virus (herpes zoster) is generally carried to the grave after infection. Furthermore, the declining lifespans of humans after the Flood may indicate an overall degeneration, such that Noah’s family may have had a lot more host immunity to diseases which now cannot be asymptomatically carried. Some disease organisms today can be carried in one part of the body, but cause disease if in another (for example, the yeast which causes vaginal ‘thrush’ is usually carried harmlessly in the intestine.) Also, some organisms only cause disease when there is a reduction in the population of beneficial germs, for instance in the intestine. The effectiveness of this way of a person being protected from an organism they were carrying by means of a flourishing population of healthy ‘good’ germs may well have decreased after the Flood. The disharmony between man and his environment may have worsened as extinction of some plant species led to dietary restrictions. Today, we know that some disease organisms (for example, the malarial parasite) are carried in, for example, mosquitoes. This raises other questions. Were flying insects part of the ‘creeping things’ which were all sent on board the Ark, or did they have their own ‘arks’ outside, such as huge rafts of matted, floating vegetation? Could the viruses survive within biting insect populations for long enough considering these insects’ life-spans? It should be remembered that not all humans would have perished in the first few weeks of the Flood. Many may have survived for some time, at first on high ground, then on makeshift rafts. This could apply especially to those dying in the late stages of the Flood, becoming bloated and floating to shore later. This seems conceivable for some moulds and bacteria—even some viruses have been known to last for decades.7 Of course, organisms then have to have an opportunity to again infect a living person. Though some viruses die readily when dry, others survive long periods in the dried state. For example, rabies virus in bat droppings can dry out to become airborne dust, which has infected cave explorers. How does anything stay dry in a worldwide Flood? Some of the floating clumps mentioned earlier may have had dry interior portions—also, some parts of the Ark itself would have provided a dry enough environment. The whole matter of apparent catastrophic snap-freezing of some mammoths in the Arctic circle is controversial as regards whether it was associated with the Flood or a post-Flood event, but it brings to mind the fact that many disease organisms survive well when frozen. In general, the Flood event was probably a warm one, but insufficient modelling has been done to establish what conditions could have been possible at the poles. None of the possibilities discussed above is presented as an answer adequate by itself for all the different types of disease organisms. Taken together, however, they demonstrate that the common anti-creationist ‘betcha-can’t-answer’ jeer about a sickly family staggering off the Ark laden with every disease known to man is a caricature which does not do justice to the known facts. Further research and thought on the subject is encouraged. This important concept is relevant to the question of how animals which today have specialized diets could have survived long migrations from Ararat, as well as to understanding how disease organisms may have become ‘choosier’ about their host. We need to understand the type of change or ‘evolution’ which is a part of the creation model. Consider, for example, the original mongrel dog population which under selection produced different races of dogs such as Chihuahua, Great Dane, etc. Each of the daughter populations has less information overall than the original, richly varied mongrel population. Similarly, an original ‘dog’ kind was likely broken up into sub-populations such as wolf, coyote, dingo, etc. However, this sort of ‘variation within a kind’ (even to the extent of separate species) is quite the opposite to the sort of evolution required to turn fish into philosophers. A rich pool of information is divided by selection into smaller, more restrictive batches of information (Chihuahuas alone can never be used to breed Great Danes—the information required is now lacking in their genes. Toy ponies and huge draught-horses were bred from wild ancestor horses, but starting with toy ponies one cannot breed draught-horses). Macro-evolution, however, requires the progressive addition of genetic information; gene pools expanding, not contracting. In real, observed changes, we see that the subgroups are more specialized than their ancestor groups. For example, highly bred varieties of pets are more likely to need special pampering, grooming and possibly even more finicky diets than their wild ancestors. Thus increasing specialization can arise with time (with no uphill evolution). The koala’s ancestor may have been less finicky about its diet, and the fragile platypus (which today is difficult to keep alive in captivity) may have been a lot more robust. In fact, evolutionists themselves claim this from the fossil record—Creation Ex Nihilo, 15(3), 1993:8. Schadewald, R.J., 1982. Six ‘Flood arguments creationist can’t answer. Creation/Evolution, IX:12–17. Return to text. Moore, R.A., 1983. The impossible voyage of Noah’s Ark. Creation/Evolution, XI:1–43. Return to text. Wieland, C., 1990. Has AIDS evolved? Creation Ex Nihilo, 12(3):29–32. Return to text. Meltzer, D., 1992. How Columbus sickened the New World. 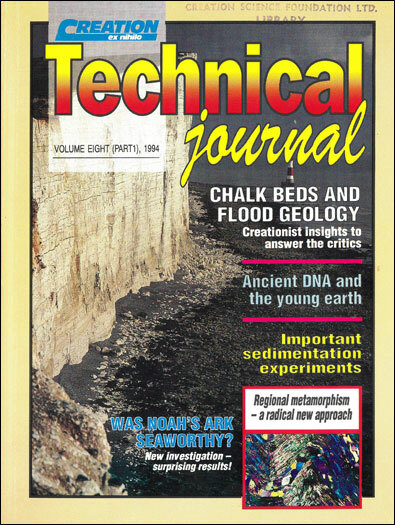 New Scientist, October 10 (1992):38–41. Vets can use human measles vaccine to inoculate dogs against distemper; the two viruses are extremely similar. Influenza still passes between humans and shearwater gulls. Return to text. HIV-2, a less virulent form discovered in West Africa, can be carried without causing AIDS-type illness in most. See: Essex, M. and Kanki, P.J., 1988. The origins of the AIDS virus. Scientific American, 259(4):44–51. Also, some carriers of HIV-1 never seem to develop the AIDS syndrome. Return to text. Nobel laureate Carlton Gadjusek mentioned this in a lecture at Royal Melbourne Hospital in July 1992 according to the recollection of several molecular biologists. Return to text. Viruses vary dramatically in stability, of course, and it is not suggested that this could apply for all present human viral diseases. Return to text.